Laser mice may be easier to find, but in many ways, optical is still the way to go if you are a gamer. When SteelSeries announced that it would be coming out with a new optical mouse, the Rival, we were obviously excited. Everyone likes something a little bit different when it comes to peripherals and that is particularly true with gaming mice. However, there are some general designs that seem just about perfect for the majority of people and from our testing, the Rival features that sort of design. At 128 grams, the mouse is relatively light, although there are some newer mice that come out closer to 110 or 120 grams. The dimensions (2.76 * 5.23 * 1.8 in) seem perfect for the average hand and with a matte coat on the top, it is unlikely that the mouse would fly out from underneath you. In terms of comfort and feel, the matte black top and textured rubber edges are great but they are prone to scratches and other marks. So, if you plan on taking the mouse around to competitions or other events, try to protect it as best as possible. None of the scratches that accumulated on our unit were anything other than artificial, but it is still nice to keep the mouse clean and unblemished. There are six programmable buttons in total, two of which are on the left side. The buttons are very responsive, although if you have smaller hands, the front-most button may be difficult to hit. As someone that does not have particularly large hands, I did find myself reaching a little bit to hit the button, however there is very little that SteelSeries could change without making things too crowded. 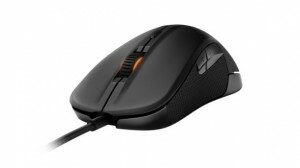 Both the scroll wheel and SteelSeries logo can be customized in SteelSeries Engine 3. As with any peripheral software, you can adjust colors, sensitivity, acceleration, etc. The only thing the average gamer will need to worry with is color (might as well make it look good) and sensitivity, which is very subjective. Setting up macros is remarkably simple in SteelSeries Engine 3 and for people that are very technical, you can setup millisecond delays in between commands. Despite the many improvements that have come to laser mice, optical still appears to be the way to go when gaming. If you do not have very small or very large hands, then the Rival’s design should be perfect and its grip makes for a very enjoyable and comfortable experience. The only legitimate issue that we found with the mouse are the interchangeable name plates on the back-end of the device. In no way do these affect performance or comfort but they do seem to be an unnecessary addition to an otherwise stripped down peripheral.